The DCS331B 20V MAX Jig Saw has an all metal, lever-action keyless blade clamp designed for quick and easy blade changes and an all-metal keyless shoe bevel with four detents at 0-deg., 15-deg., 30-deg., and 45-deg. to make bevel adjustments easy. The variable speed trigger provides up to 3,000 strokes per minute to easily adjust speeds during cutting and 4-position orbital action for wood cutting. A removable shoe cover helps protect materials from scratches and the dust blower helps users see where they're cutting. Battery and charger sold separately. Used it several times in last 2 weeks works great. I used this tool to install an over the oven microwave exhaust through the cabinet it was attached to. Used it to cut the bottom of the cabinet for the microwave exhaust to pass through and also a 6 inch hole for the duct work to pass through the top of the cabinet. Also used it to exit the exhaust through the soffit of the house. It worked great. Plenty of power but very accurate cutting. I love these DeWalt tools. I bought this a few days and have no doubts that I made a great decision to pull the trigger in this jigsaw. I’ve been renovating my kitchen and being that a circular saw was the only power saw in my tool arsenal made me go to the store and search for a jigsaw. I recently bought the Dewalt cordless angle grinder “which has massive power but the battery drains quick” so I purchased the dewalt dcs331 to assist the job and add to my dewalt collection. By far the best tool of the lot. Very durable and strong. The battery also lasted a lot longer than expected. Definitely would recommend it. When is Dewalt bringing out a jigsaw with a LDE light? .Will 18 volt battery work on this 20 volt saw? BEST ANSWER: An 18v battery will not work on this 20v saw or any 20v tools for that matter. 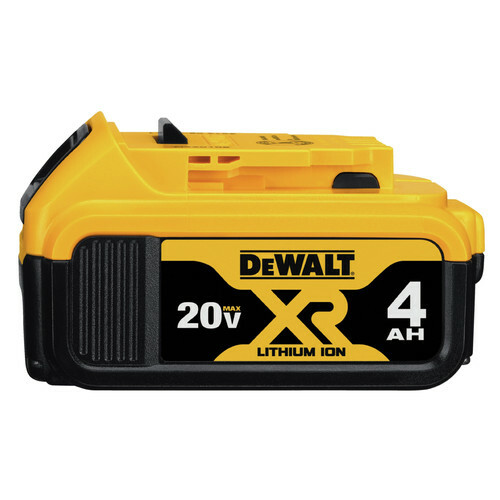 However, a 20v battery will work when combined with DeWalt's 18v-20v Adapter (DCA1820) on most 18v tools. You can check their website for exceptions which are mostly items that charge the battery as well like some of the job site radios or work lights. Can I use a standard 20v dewalt battery with this unit? BEST ANSWER: There is no plain 20v battery without the max, they're all 20v max. Now some some are 20v max xr, but still all interchangeable. Just a marketing tool to get people buying newer brush less tools to buy new batteries as well. Yes. You can use any of the 20v Dewalt batteries. This is a great jigsaw. Yes,any 20 volt max Dewalt battery can be used with this jigsaw. BEST ANSWER: This jig saw is a bare tool, no case is included. This jig saw is a bare tool, no case is included. Can I use a 40V or 60V Flexvolt battery with this saw? BEST ANSWER: Model DCS331B will not work with the 40 Volt or 60 Volt battery.